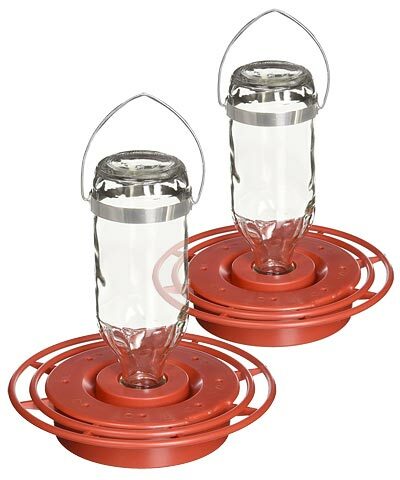 Entice hummingbirds to dine in your garden by placing these Best-1 Glass Hummingbird Feeders in it. The familiar elements and lasting materials of these units combine for easy-to-use and fun additions to your bird sanctuary. Each glass bottle holds up to 8 ounces of nectar, offering food to a few hummingbirds at once. Each bottle installs onto a red, plastic saucer base, and eight ports here allow several hummingbirds to reach their treat. The bee and wasp resistant ports help keep nectar clean, and an integrated perch around the bases creates places for birds to sit while dining. Open the center of each base for thorough cleaning, and check the clear bottles regularly to monitor nectar levels. Hang the feeders from a branch or hook using their attached metal hangers, so you can enjoy all the avian antics. Turn part of your landscaping into a hummingbird haven with these two Glass Hummingbird Feeders. Made in the USA. Best-1 Glass Hummingbird Feeder, 8 oz. Lone Wolf Raindrop Hummingbird Feeder, Red Posy, 6 oz.